The aim of this paper was to evaluate the role of laparoscopic cholecystectomy (LC) in the management of acute biliary pancreatitis before patient discharge from the point of view of availability, advantages, and disadvantages. In patients with mild gallstone pancreatitis, cholecystectomy during the same hospital admission might reduce the risk of recurrent gallstone-related complications, compared with the more commonly used strategy of interval cholecystectomy. However, evidence to support same-admission cholecystectomy is poor, and concerns exist about an increased risk of cholecystectomy-related complications with this approach. In this study, we aimed to compare same-admission and interval cholecystectomy, with the hypothesis that same-admission cholecystectomy would reduce the risk of recurrent gallstone-related complications without increasing the difficulty of surgery. This is a prospective study carried on 20 consecutive patients in Menoufia University, Faculty of Medicine and Alexandria University, Faculty of Medicine; all of them presented with symptoms of acute biliary pancreatitis from April 2015 to September 2016. Overall, 20 cases were included because of limited number of patient who presented to our hospital in this period of time and fulfilled the inclusion criteria. Computed tomography severity index is the main method for choosing patients in the study then assess operative time and difficulty and postoperative pain and hospital stay and recurrence of attacks. A total of 20 cases underwent LC at the same time of admission in the hospital, and none of them (0%) were converted to open technique; operative time and difficulty was average, and all of them (100%) had no recurrent attacks of pancreatitis in postoperative follow-up. LC in mild acute biliary pancreatitis is safe and should be done during the same hospital admission to prevent further attacks of pancreatitis. Acute biliary pancreatitis is a common condition throughout the world, marked by pancreatic inflammation caused by gallstones. Although initial treatment of biliary pancreatitis is supportive, definitive treatment of biliary pancreatitis to prevent recurrence requires cholecystectomy to remove the source of gallstones. Without definitive treatment, the recurrence rate of biliary pancreatitis is as high as 60% [1–3]. Historically, cholecystectomy for biliary pancreatitis has often been delayed from index hospitalization to allow the patient to recover from physiologic insult of the inciting pancreatitis ,. However, in the last decade, the standard of care for the timing of cholecystectomy now trends toward earlier intervention. Doing laparoscopic cholecystectomy (LC) within 2 weeks of the index admission to prevent biliary pancreatitis recurrence and shorten overall hospital stay has been recommended, as early cholecystectomy is beneficial compared with delayed surgery ,,,. LC is the gold standard operation for cholecystectomy , and several studies have also found that LC is a safe and efficient treatment approach for acute biliary pancreatitis compared with open cholecystectomy ,. Decreased length of hospital stay could be achieved safely with LC for mild biliary pancreatitis, even with elevated serum pancreatic enzymes and persistent abdominal pain, with no increase in intraoperative complications or technical difficulty . Early LC for biliary pancreatitis decreases cost for the patient by decreasing the need for long hospital stay, ICU admission, and endoscopic retrograde cholangiopancreatography if recurrent attacks of biliary pancreatitis with increased risk for obstructive jaundice to occur; moreover, it is feasible and easy, and decreases the rate of biliary system injury during surgery. Preventing recurrent attacks of biliary pancreatitis avoids high risk of multiple organ failure during attacks of pancreatitis . The aim of the work was to evaluate the role of LC in the management of acute biliary pancreatitis before patient discharge from the point of view of availability, advantages, and disadvantages. All patients gave written informed consent before inclusion into the study. This is a follow-up study carried on 20 consecutive patients in Menoufia University, Faculty of Medicine and Alexandria University, Faculty of Medicine; all of them presented with symptoms of acute biliary pancreatitis from April 2015 to September 2016. A written informed consent from each patient was obtained before study participation and after full explanation of the technique and its possible complications. The study was approved by our Faculty Ethical Committee. The inclusion criteria were patients with chronic calculous cholecystitis associated with acute pancreatitis, demonstrated by elevated serum levels of amylase and lipase, ultrasonographic findings of pancreatitis, and computed tomography severity index (CTSI) of mild pancreatitis. The exclusion criteria were pancreatic pseudocyst, pancreatic abscess, pancreatic fistula, past history of previous upper abdominal operation which should exclude laparoscopy, coagulation disorders, CTSI more than 5 (severe pancreatitis), and unfit for laparoscopic surgery (glaucoma, pulmonary emphysema, or heart failure). All patients were subjected to the following: thorough history taking and physical examination. The following groups underwent further investigations: patients who complained of manifestations of chronic calculous cholecystitis (fatty dyspepsia and biliary colics) with a recent history of obstructive jaundice and patients with manifestations of pancreatitis as epigastric pain referred to the back associated with nausea and vomiting. These patients were subjected to the following investigations: laboratory investigations included serum bilirubin (total and direct), alkaline phosphatase (ALP), alanine aminotransferase (ALT), aspartate aminotransferase (AST), serum amylase, serum lipase, and white blood cell (WBC) count. Imaging included abdominal ultrasonography, which shows gallbladder stones, intrahepatic bile duct, and bulky pancreas, and if there is dilated common bile duct (CBD) by ultrasound or elevated ALP enzyme, the patients were subjected to further magnetic resonance cholangiopancreatography (MRCP) to verify the cause of obstructive jaundice. CT of the abdomen shows gallstones, CBD diameter, bulky pancreas, peripancreatic fluid collection, or complications such as necrosis or pseudocyst. Research has shown some advantages of the CTSI in predicting the severity of acute pancreatitis compared with the other systems. CTSI of 5 or greater correlated with prolonged hospitalization and higher rates of mortality and morbidity. A CTSI score of 5 or greater was associated with a mortality rate higher than in those with a score of less than 5. The numerical CTSI has a maximum of 10 points and is the sum of the Balthazar grade points and pancreatic necrosis grade points. If the patient is evaluated as a mild case of acute pancreatitis (CTSI score less than 5), we will proceed to LC within 72 h from assessment. Grade A is considered when the patient's computed tomography (CT) result of the abdomen is normal, and this equals 0 point. Grade B is considered when there is focal or diffuse enlargement of the pancreas, and this equals 1 point. Grade C is considered when there is pancreatic gland abnormalities and peripancreatic inflammation, and this equals 2 points. Grade D is considered when there is fluid collection in a single location, and this equals 3 points. Grade E is considered when there is two or more fluid collections and/or gas bubbles in or adjacent to pancreas, and this equals 4 points. When there is no necrosis, it equals 0 points. If the necrosis percent is 0–30%, it equals 2 points. If the necrosis percent is 30–50%, it equals 4 points, and if the necrosis percent is more than 50%, it equals to 6 points. LC was done for all patients subjected to the study, and intraoperative assessment is done according to time, difficulty, and conversion to open surgery when required. Conversion to open procedure was performed through a right subcostal incision. Laparoscope used was the Karl Storz Endoscope set, telecam DX II, Hopkins II optics, code no. 26003 BA, Karl Storz SE & Co. KG, Germany. The protocol of general anesthesia was uniform in all patients; isoflurane 1–2% was used for maintenance. Prophylactic antibiotics were given at the time of induction of anesthesia, usually third-generation cephalosporins. Position of the patient was supine on an radiography operation table. Laparoscopic instruments were placed on a separate stand located on the patient's left. This arrangement allowed efficient surgeon access to the instruments with the least chaos. All operating room personnel were appropriately protected with lead aprons to minimize their exposure to radiation if intraoperative cholangiogram is planned to exclude CBD stones. Insertion of a suitable size nasogastric tube was done to deflate the stomach. Laparoscopic ports were placed in the standard approach used in LC. A four-port technique as described by Reddick and Olsen  was employed with a zero degree laparoscope. A supraumblical port of 5–12 mm was inserted by the closed method. Another 5–12 mm epigastric and two 5 mm right subcostal ports were inserted under direct vision. We preferred the use of disposable Endopath Bladeless XCEL trocars (5–12 mm) with transparent obturator for optical entry (B12LT; Ethicon Endosurgery, Guaynabo, PR 00969, United States). Exploration of the abdomen was done. The gallbladder is grasped from its fundus. If necessary, the gallbladder is emptied through aspiration to help better grasping. Traction on the Hartmann's pouch was performed to expose the cystic duct. Identification of Calot's triangle was done. Dissection of the cystic duct and cystic artery was done separately, and both are clipped and divided. The gallbladder will be dissected off its bed with a monopolar cautery hook. At the completion of the surgery, the gallbladder will be placed in a retrieval bag and extracted through the epigastric incision. Hemostasis was achieved in the gallbladder bed, and after through saline lavage, a tube drain was placed if clinically indicated, and the incisions closed. Postoperative analgesia was carried out with ketorolac during the first 24 h postoperatively and thereafter at the request of the patient. Patients were observed for sepsis, bleeding, pancreatitis, and bile leak. These complications could occur usually within the first 24 h postoperatively. Routine postoperative laboratory tests included serum amylase, serum lipase, and WBC count. All patients had warm oral liquids in the evening after the operation, provided there was no nausea or vomiting. Most patients were discharged from the hospital after 24 h. Patients were reviewed at weeks 1 and 4 postoperatively in the surgical outpatient clinic. Patients were instructed to notify after discharge about any clinical symptoms or any laboratory or imaging data that they had obtained because of the possibility of a postoperative biliary disease. It included assessment of pain, total length of hospital stay, need for ICU admission and total stay in ICU, recurrence of attacks of biliary pancreatitis, organ failure, biliary leakage, incidence of attacks of cholangitis, and cost. Complications were defined as any intraoperative or postoperative (30 days after the operation) events that altered the clinical course such as complications of LC (bile duct lesions, bleeding, abdominal collection), pneumonia, additional procedures, and readmissions. Later on, patients were followed up in the outpatient clinic on monthly intervals for 3 months; liver function tests and ultrasonography of the abdomen were performed to exclude missed stones or other long-term complications. Follow-up was done by clinical observation of abdominal pain, the color of sclera, asking about the color of the urine and stool, serum bilirubin (total and direct), ALP, amylase, and lipase, ultrasonography of the abdomen (after 1 month). MRCP if indicated (suspicion of the presence of retained stones). A total of 20 patients were included; there were 14 (70%) women and six (30%) men, with mean ± SD age of 42 ± 16.26 years, median age of 39 years, and range of 22–75 years [Table 1]. The most important eight laboratory investigations that were observed in our patients were as follows: ALT, AST, ALP, total bilirubin, direct bilirubin, WBC count, serum amylase, and lipase. [Table 2] illustrates the number of abnormal findings of these eight variables among our patients. In two (10%) patients, all the eight variables were elevated. The mean value for ALP was 189.5 ± 111.92 U/l (range: 79–445 U/l), total bilirubin was 2.33 ± 1.97 mg/dl (range: 0.6–6.3 mg/dl), direct bilirubin was 1.46 ± 1.79 mg/dl (range: 0.1–5.9 mg/dl), AST was 209.7 ± 252.41 U/l (range: 27–914 U/l), ALT was 118.1 ± 175.25 U/l (range: 17–580 U/l), WBC count was 11.21 + 4.48 cells/cm 3 (range: 4.1–18.9 cells/cm 3), serum amylase was 790.4 + 897.5 U/l (range: 47–2933 U/l), and serum lipase was 1059.5 + 1629.46 U/l (range: 52–5182 U/l). ALP was elevated in 14 (70%) cases. Total bilirubin was elevated in 12 (60%) cases, and levels higher than 4 mg were found in eight (40%) cases. Direct bilirubin was elevated in 10 (50%) cases. AST was elevated in 14 (70%) cases, ALT in eight (40%) cases, WBC count in 14 (70%) cases, serum amylase in 18 (90%) cases, and serum lipase in 16 (80%) cases [Table 2]. At initial presentation, all cases (20 cases, 100%) complained of pain (epigastric pain referred to the back). Pain was characterized most frequently as severe pain and described as knifing to the back. It precedes the onset of nausea and vomiting, and vomiting does not relieve the pain [Table 3]. Obstructive jaundice was present in 12 (60%) cases at the time of presentation. In contrast, absence of any history of jaundice was claimed by eight (40%) patients. Two (10%) cases had a positive history of cholangitis (i.e., pain, fever and chills, jaundice and leukocytosis), and two (10%) cases presented with a history of previous attack of gallstone pancreatitis documented by previous high serum amylase and lipase levels and positive findings on ultrasonography and CT of the abdomen. 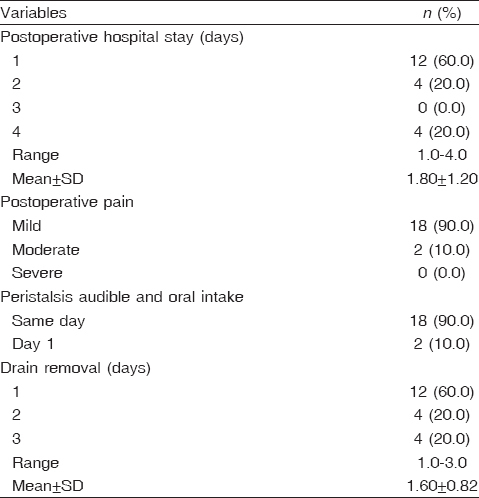 Duration of symptoms before the procedure varied as follows: the mean ± SD duration of symptoms before diagnosis was 8.5 + 8.61 days, median was 5.5 days, and ranged from 2 to 30 days [Table 3]. The second is the CTSI: it is calculated by adding the Balthazar score to the percentage of pancreatic necrosis. 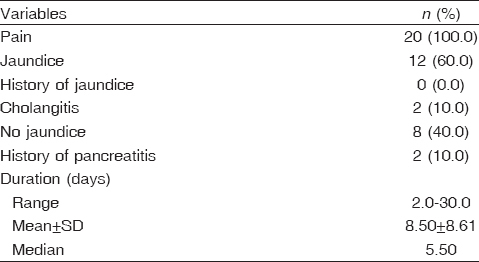 Most cases are equal or below 4, which are considered as mild pancreatitis. Score 1 in two (10%) cases, score 2 in six (30%) cases, score 3 in four (20%) cases, and score 4 in six (30%) cases. Only two cases had score of 5 (10%), in which pancreatic necrosis was present in percentage ranging from 30 to 50% [Table 4]. MRCP was done in four (20%) cases only and revealed multiple small gallstones in these four cases, with only minimal intrahepatic biliary radical dilatation in two (10%) cases. The CBD was free in these four cases, with diameter ranging from 7 to 9.5 mm, and mean ± SD diameter of 8.25 ± 1.44 mm [Table 5]. All cases are managed during the same hospital stay with LC; all cases were done laparoscopically, and no conversion to open surgery was needed in any case. The mean duration of LC was 53 + 12.61. From insertion of Veruss needle till the end of the operation, the median time was 52.5 min, ranging 30–75 min [Table 6]. In the present study, the mean hospital stay was 1.8 ± 1.2 days (range: 1–4 days). A total of 18 (90%) patients experienced mild pain, which relieved completely with the intake of two intravenous injections of NSAID followed by oral intake of NSAIDs, as if LC for chronic calculous cholecystitis was done. In two (10%) cases, the pain was moderate, and only partially improved with NSAIDs. Postoperative discharge for cases in our study was on postoperative day 1 in 12 cases, postoperative day 2 in four cases, and postoperative day 3 in four cases. There were no mortalities [Table 7]. In our study, the mean age of patients was 42 ± 16.26 years. In the study by Rosing et al. , the mean age was close to our patients of 40 years (range: 28–54 years). In the study by Judkins et al. , the mean age was 38.2 + 16.0 years (range: 20–80 years), and in the study by Nebiker et al. , the median age was 60 years (range: 29–83 years), which was older than our study. Nguyen et al. reported mean age of 59.6 + 20.2 years. The reason that the mean age in our study was younger than most similar studies is that we select our cases to be generally fit for anesthesia and laparoscopy. However, 30% of our patients were older than 50 years. In our study, regarding female to male ratio, among the 20 cases, 14 (70%) cases were females, and six (30%) patients were males; this was expected as the incidence of gallstones and biliary pancreatitis is higher in females than in males. This is in accordance with most similar studies: Nguyen et al. – 63% females and 37% males, Nebiker et al. – 66% females and 34% males, Judkins et al. – 78% females and 22% males, and also Ito et al. – 67% females and 33% males. In our study, the mean duration of symptoms before hospital admission was 8.50 ± 8.61 days, average of 2–30 days and median of 5.5 days; in the study by Rosing et al. , the duration of symptoms before diagnosis was short and less than 48 h, which reflects that our patients were presented late, sought medical advice late, or were misdiagnosed. In our study, the most important laboratory investigations that were observed were ALT, AST, ALP, total bilirubin, direct bilirubin, WBC count, serum amylase, and lipase. In two (10%) patients, all the eight variables were elevated; in six (30%) cases, seven variables were elevated; in two (10%) cases, six variables were elevated; in six (30%) cases, four variables are elevated; and in four (20%) cases, only two variables were elevated. Our study depends on CTSI, whereas other studies depend on Ranson's score below or equal to 3 to diagnose cases of mild biliary pancreatitis; however, in our study, it was difficult to depend on Ranson's score because it takes 48 h for full assessment and delayed presentation of our patients. In the study by Nebiker et al. , the diagnosis was based on history, three-fold increase in serum amylase activity, and radiological investigations. In our study, 12 (60%) patients had jaundice, so the presence of CBD stones must be excluded. Results of several studies , indicated that the most accurate predictors of CBDS were serum bilirubin level (positive predictive value of 57%, negative predictive value of 66%), serum ALP level (positive predictive value of 53%, negative predictive value of 65%), and dilated CBD (positive predictive value, negative predictive value 64%). A combination of these factors yielded a sensitivity of 68% and a specificity of 80% and could determine the subsequent procedure to be used. In our study, the CBD was dilated in eight (40%) cases, without visualization of CBD stones by ultrasonography, and was dilated on six (30%) cases by CT scan, so further evaluation of the CBD was required by either MRCP or intraoperative cholangiography. Studies by Majeed and colleagues , have shown a dilated CBD on ultrasonography to be predictive in 20–70% of cases with choledocholithiasis, whereas evidence of stones in a dilated duct at ultrasonography was almost uniformly accurate. 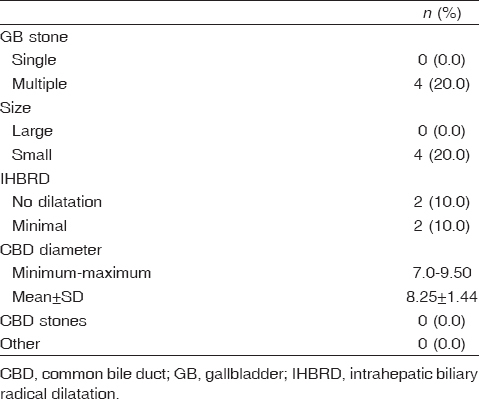 In our study, MRCP was done in four (20%) cases, which revealed calcular gallbladder disease, with minimal intrahepatic biliary radical dilatation in two (10%) cases, and no CBD stones were present in any case. MRCP is a safe and sensitive imaging technique for CBD pathology, when used to exclude CBD stones. MRCP is a safe and sensitive imaging technique for CBD pathology when used to exclude CBD stones. Miletic et al. reported that MRCP has the potential to replace diagnostic endoscopic retrograde cholangiopancreatography in all patients with suspected choledocholithiasis owing to its high accuracy. Dalton et al. reported that MRCP should be the only investigation used to exclude CBD stones. Makary et al. and Hallal et al. , suggest that MRCP may be associated with favorable performance characteristics (including high sensitivity and negative predictive value) in the detection of choledocholithiasis among patients with biliary pancreatitis. Because MRCP is noninvasive, it is an attractive option for patients at low risk for choledocholithiasis. In our study, LC (without laparoscopic CBD exploration) was done in 20 (100%) cases, in whom no CBD dilatation was present (by ultrasound or CT) or dilated CBD but stones were excluded using MRCP. There were no intraoperative difficulties, operative time was close to the time consumed in similar studies, no intraoperative complications were present such as bleeding or CBD injury, and postoperative complications were minor such as one case of minor bile leak which stopped spontaneously and one case port site infection which was completely cured by antibiotics. There were no major postoperative complications such as jaundice owing to retained CBD stones or biloma formation because of bile leakage. In our study, the range of postoperative hospital stay was between 1 and 4 days, and this is one of the main advantages of early cholecystectomy in shortening the hospital stay and preventing recurrent attacks of biliary pancreatitis that require readmission to the hospital. In our study, there were no major intraoperative complications, no conversion to open was done in any case, and the operative time range was between 30 and 75 min. In the study by Ammori et al. , despite increased age and comorbidity and more frequent adhesions, their data showed no evidence that intraoperative or postoperative complications were more frequent in patients with biliary pancreatitis than in other patients undergoing LC. They consider that a policy of 'same-admission' cholecystectomy is appropriate for patients with acute pancreatitis owing to gallstones. Surprisingly, despite the release of the UK guidelines for acute pancreatitis, several studies reported that early cholecystectomy was performed in only a minority of patients ,. Surprisingly, in studies from the USA and Australia, cholecystectomy was performed too late and only in a minority of patients. LC in mild acute biliary pancreatitis cases is safe and should be done during the same hospital admission to prevent further attacks of pancreatitis. Lee JK, Ryu JK, Park JK, Yoon WJ, Lee SH, Hwang JH, Kim YT, Yoon YB. Roles of endoscopic sphincterotomy and cholecystectomy in acute biliary pancreatitis. Hepatogastroenterology 2008; 55:1981–1985. Whitcomb DC. Clinical practice. Acute pancreatitis. N Engl J Med 2006; 354:2142–2150. Venneman NG, Buskens E, Besselink MG, Stads S, Go PM, Basscha K. et al. Small gallstones are associated with increased risk of acute pancreatitis: potential benefits of prophylactic cholecystectomy? Am J Gastroenterol 2005; 100:2540–2545. Blum T, Mai sonneure P, Lowenfels AB, Lankisch PG. Fatal outcome in acute pancreatitis: its occurrence and early prediction. Pancreatology 2001; 1:237–241. Mutinga M, Rosenbluth A, Tenner SM, Odze RR, Sica GT, Banks PA. Does mortality occur early or late in acute pancreatitis? Int J Pancreatol 2000; 28:91–95. McCullough L, Sutherland F, Preshaw R, Kim S. Gallstone pancreatitis: does discharge and readmission for cholecystectomy affect outcome? HPB(Oxford) 2003; 5:96–99. Uhl W, Müller CA, Krähenbühl L, Schmid SW, Schölzel S, Büchler MW. Acute gallstone pancreatitis timing of laparoscopic cholecystectomy in mild and severe disease. Surg Endosc 1999; 13:1070–1076. Hernandez V1, Pascual I, Almela P, Añon R, Herreros B, Sanchiz V, Minguez M, Benages A. Recurrence of acute gallstone pancreatitis and relationship with cholecystectomy or endoscopic sphincterotomy. Am J Gastroenterol 2004; 99:2417–2423. Cuschieri A1, Dubois F, Mouiel J, Mouret P, Becker H, Buess G, Trede M, Troidl H. The European experience with laparoscopic cholecystectomy. Am J Surg 1991; 161:385–387. Eldar S, Sabo E, Nash E, Abrahamson J, Matter I. Laparoscopic versus open cholecystectomy in acute cholecystitis. Surg Laparosc Endosc 1997; 7:407–414. Aboulian A1, Chan T, Yaghoubian A, Kaji AH, Putnam B, Neville A, Stabile BE, de Virgilio C. Early cholecystectomy safely decreases hospital stay in patients with mild gallstone pancreatitis: a randomized prospective study. Ann Surg 2010; 251:615–619. Bouwense SA1, Besselink MG, van Brunschot S, Bakker OJ, van Santvoort HC, Schepers NJ, Boermeester MA, et al. Pancreatitis of biliary origin, optimal timing of cholecystectomy (PONCHO trial): study protocol for a randomized controlled trial. Trials 2012; 621:3–5. Reddick EJ, Olsen DO. Laparoscopic laser cholecystectomy. A comparison with mini-lap cholecystectomy. Surg Endosc 1989; 3:131–133. Rosing DK, de Virgilio C, Yaghoubian A, Putnam BA, El Masry M, Kaji A, et al. Early cholecystectomy for mild to moderate gallstone pancreatitis shortens hospital stay. J Am Coll Surg 2007; 205:762–766. Judkins SE, Moore EE, Witt JE, Barnett CC, Biffl WL, Burlew CC, et al. Surgeons provide definitive care to patients with gallstone pancreatitis. Am J Surg 2011; 202:673–677. discussion 677–678. Nebiker CA, Frey DM, Hamel CT, Oertli D, Kettelhack C. Early versus delayed cholecystectomy in patients with biliary acute pancreatitis. Surgery 2009; 145:260–264. Ito K, Ito H, Tavakkolizadeh A, Whang EE. Is ductal evaluation always necessary before or during surgery for biliary pancreatitis? Am J Surg 2008; 195:463–466. Millat B, Fingerhut A, Deleuze A, Briandet H, Marrel E, de Seguin C, et al. Prospective evaluation in 121 consecutive unselected patients undergoing laparoscopic treatment of choledocholithiasis. Br J Surg 1995; 82:1266–1269. Trondsen E, Edwin B, Reiertsen O, Fagertun H, Rosseland AR. Selection criteria for endoscopic retrograde cholangiopancreaticography (ERCP) in patients with gallstone disease. World J Surg 1995; 19:852–856. discussion 857. Majeed AW, Ross B, Johnson AG, Reed MW. Common duct diameter as an independent predictor of choledocholithiasis: is it useful? Clin Radiol 1999; 54:170–172. Vitale GC, Larson GM, Wieman TJ, Cheadle WG, Miller FB. The use of ERCP in the management of common bile duct stones in patients undergoing laparoscopic cholecystectomy. Surg Endosc 1993; 7:9–11. Miletic D, Uravic M, Mazur-Brbac M, Stimac D, Petranovic D, Sestan B. Role of magnetic resonance cholangiography in the diagnosis of bile duct lithiasis. World J Surg 2006; 30:1705–1712. Dalton SJ, Balupuri S, Guest J. Routine magnetic resonance cholangiopancreatography and intra-operative cholangiogram in the evaluation of common bile duct stones. Ann R Coll Surg Engl 2005; 87:469–470. Makary MA, Duncan MD, Harmon JW, Freeswick PD, Bender JS, Bohlman M, et al. The role of magnetic resonance cholangiography in the management of patients with gallstone pancreatitis. Ann Surg 2005; 241:119–124. Hallal AH, Amortegui JD, Jeroukhimov IM, Casillas J, Schulman CI, Manning RJ, et al. Magnetic resonance cholangiopancreatography accurately detects common bile duct stones in resolving gallstone pancreatitis. J Am Coll Surg 2005; 200:869–875. Ammori BJ, Davides D, Vezakis A, Larvin M, McMahon MJ. Laparoscopic cholecystectomy: are patients with biliary pancreatitis at increased operative risk? Surg Endosc 2003; 17:777–780. Sargen K, Kingsnorth AN. Management of gallstone pancreatitis: effects of deviation from clinical guidelines. JOP 2001; 2:317–322. Senapati PSP, Bhattarcharya D, Harinath G, Ammori BJ. A survey of the timing and approach to the surgical management of cholelithiasis in patients with acute biliary pancreatitis and acute cholecystitis in the UK. Ann R Coll Surg Engl 2003; 85:306–312.